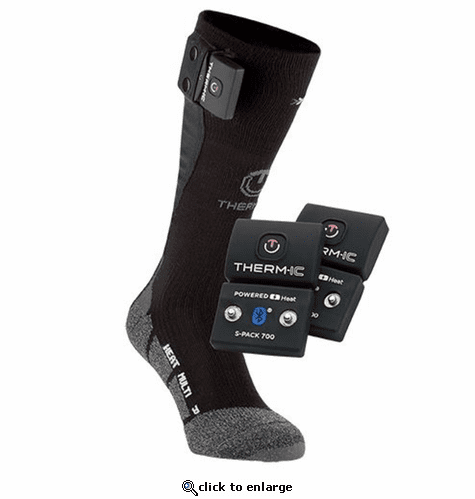 Comprising high-tech materials and the full range of X-SOCKS technology features, the Therm-ic PowerSocks heated sock guarantees effective distribution of heat to the whole of the foot during outdoor winter activities. Materials: Polyamide 50% (nylon), Acrylic 30%, Polypropylene 9%, Polyester 8%, Elastane 3%. X-Technology fibers: Nylon 48%, Acrylic 30%, Mythlan 9%, XITANIT 8%, Elastane 3%, Robur 2%.